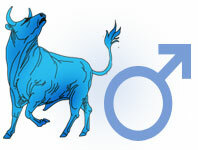 The Zodiac Sign Taurus Man (April 21 - May 21), Taurus Personality Traits for Male born under April Zodiac signs. Taurus man is a very vulnerable and sensitive person, but outwardly always looks unruffled and monumental. He is very careful in affairs and would not take up any affair without first thinking over it, but if he has already started moving in one direction, it is difficult to stop him on this path. It is because of his extreme caution that Taurus seems very slow, and truly, he prefers better not hurrying to dealing with later correcting mistakes, which may be made in a haste. Taurus is a very practical man, and everything he does or thinks is very close to reality - he is not fond of empty dreams and fantasies. Taurus man is very hardworking, he believes that one needs to pursue and achieve everything in life through one's efforts. He is very hard-working, and the leadership of any company knows that Taurus can be entrusted with the most complex and routine affairs that require enormous physical and moral strength, and Taurus will deal with them in the best form. Taurus hobbies are also "worldly" - he loves nature and rests only in the bosom of nature. He loves fishing, sitting around the campfire, hunting, happily cultivates his garden and does not want to spend his vacation at the beach or in a super-modern hotel. Taurus man is very stubborn, he is persistent in his line always, despite objections of others, and it should be said that many of the obstacles that would be all-out for other zodiac signs, give in to Taurus man's extraordinary power. This representative of the zodiacal circle is not a careerist, but always tries to be better, improve himself, and this leads him finally to a high position and authority in society. Taurus man is the most "right" and organic type of a company head that can be imagined. He will achieve high results for the company, and at that, will not forget about justice, conscience and honor. Taurus man's purpose in life – have a good family, strong and comfortable warm home. With such a partner, any woman will always be safe and reliable. Taurus man always makes plans for the near future, but without dreams. He always follows that which he has planned for, and keeps his word, being a reliable partner both at work and in personal life. Taurus man never forgets anything - he remembers every detail and all the dates, and so he is methodical. From year to year, he wishes people a happy birthday, congratulates them on their wedding anniversaries and so on. Due to good memory, Taurus man often has a have a reputation for vindictive person, because he will never forget those of who once deceived or betrayed him. Extremely honest and fair, Taurus man demands the same from his environment. Taurus man will do everything that he could for his beloved woman. He will be a bit romantic, would make interesting and expensive gifts, beautifully care for her and carry her on his hands. Not building castles in the air, not reassuring on vain dreams, Taurus man will give everything he has. Even if at the time of acquaintance with his partner, he has not yet managed to achieve great heights in his career and material well-being, she can be sure that all this will soon be because caring for his beloved woman and his family is Taurus man's main objective in life, which he will always fulfill excellently. Taurus's house is always a full cup, he is a very practical, good-natured and hospitable host. In turn, Taurus man expects from his sweetheart uprightness, calmness, love and loyalty. He cannot live with a flirt of whom staying in the society is more important than domestic comfort and warmth. I'm so blessed with Taurus lifetime partner. 99% true. There's only one thing missing, he forgot my birthday and greeted me "happy natal day"
I have one already, Lucky me!! I need taurus man year of the rat in my life. I will love him for the rest of my life. Full description of Taurus Man, character traits and personality characteristic for male Taurus.